My bag, in black. It's also available with a Pedro's flower print for those feeling ostentatious! Pedro's USA is a company well-known for respecting the environment. They became famous for their tire levers and watter bottle cages made from recycled milk bottles and currently offer a vegetable-derived chain lube known as Chainj (pronounced "change"). Rather than a typical "cradle to grave approach," Pedro's designs products whose materials will continue to be useful after their lifespan. The durable, recyclable Ethik seatbag - composed of HDPE - is a prime example. The Ethik bags are made in former textile factories in Quebec. Many of the employees were laid off when their jobs were shipped overseas to cut corporate costs. The influx of new jobs offers revitalization to these devastated communities. Pedro's sweats the details with these bags. Manufacturing is positioned close to distribution centers to minimize greenhouse gases. The simple, minimalist packaging uses soy-based inks printed onto recycled cardboard. OK, so we can feel good about benefiting people and the planet with this purchase. But without a competitive cost and high-performance, cyclists just aint gonna buy it. Well, they're $20, easy to install, stay tightly in place, and at only 32 grams are the lightest and - according to Pedro's - most aerodynamic seatbag on the market. They're also, to my knowledge, the only waterproof saddle bag out there. I've been using mine for a few months and it's none the worse for wear. The only caveat: They look funky. To me, and my off-the-beaten-path aesthetic, this is a plus. But, if you need something to match the sleek Italian styling of your Colnago Ferrari, you might want to look elsewhere. 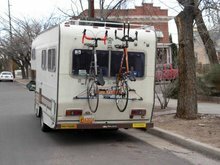 Then again, those folks likely have a domestique to carry their tubes and inflation gizmos anyhow. In my book, Ethik gets a big thumbs up! More from Pedro's website here.